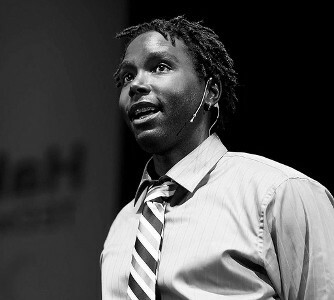 As the inaugural Poet Laureate of Albuquerque, NM (2012-2014), Hakim Bellamy is a national and regional Poetry Slam Champion and holds three consecutive collegiate poetry slam titles at the University of New Mexico. His poetry has been published in Albuquerque inner-city buses and various anthologies. Bellamy was recognized as an honorable mention for the University of New Mexico Paul Bartlett Re Peace Prize for his work as a community organizer and journalist and was recently bestowed the populist honor of “Best Poet” by Local iQ (“Smart List” 2010, 2011 & 2012) and Alibi (“Best of Burque” 2010, 2011 & 2012). He is the co-creator of the multimedia Hip Hop theater production Urban Verbs: Hip-Hop Conservatory & Theater that has been staged throughout the country. He facilitates youth writing workshops for schools and community organizations in New Mexico and beyond. Hakim is currently finishing his MA in Communications and Journalism Department at the University of New Mexico. He is the proud father of a 4 year-old miracle and works as the Strategic Communication Director at Media Literacy Project. Hakim’s journey as a poet has come full circle as of late, wearing the hat of musician. A product of the Hip Hop generation and influenced by his parents extensive wax collection (which included the likes of Janis Joplin, Sly and The Family Stone, Carlos Santana & Buddy Miles, The Grateful Dead, Gil Scott Heron, The Temptations, Teddy Pendergrass & The Last Poets), Bellamy is equal parts musical artist, archivist and archeologist. He digs music. Piano lessons, recitals and many years singing in the church choir prepared him for the funk-infused, experimental yet melodic brand of Hip Hop that he produces today with creative partner Colin “Diles” Hazelbaker. He’s shared the musical stage with Zion-I, The Wailers, The Last Poets, Amiri Baraka, Cecil Taylor & Blacklisted Individuals. As an actor, Hakim has grown his talent on both the screen and the stage. He made a cameo in the independent film Romeo & Juliet Vs. The Living Dead (2009) and has made multiple appearances in local commercials (Television and Radio). He has done voice work for television and radio, worked for two years as a radio journalist at KUNM 89.9FM in Albuquerque, NM and has been cast as an extra in such films/tv shows as Gamer (2009), Swing Vote (2009) & Crash the Television Series, Season II (2010). On the stage Hakim was cast in a major role in the 2009 Albuquerque production of The Exonerated, produced by NMRepeal.org. In the summer of 2011, Hakim secured a major role as the Friar in the Vortex Theater’s Summer Shakespeare Festival production of Romeo & Juliet for a 14 show run. He has since co-written and starred in Urban Verbs: Hip Hop Conservatory & Theater with his creative partner Carlos Contreras.